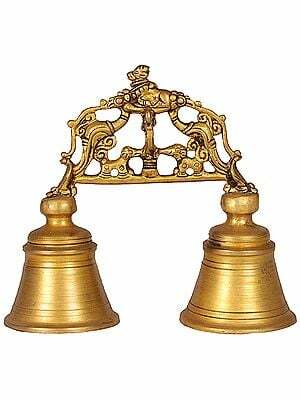 Otherwise a simple brass-cast, the bell, unique in its concept combining with functionality the beauty, spiritualism and myth, has become a magnificent piece of art. 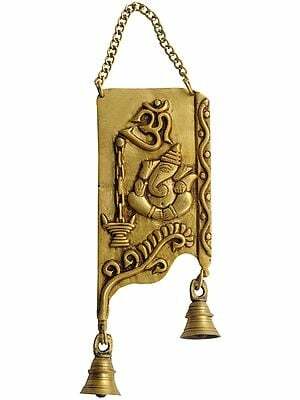 A bell is since times immemorial one of the main components of ritual paraphernalia held in great reverence in most of the religious traditions, Christianity, Buddhism, Hinduism, Jainism and those of early Greece. 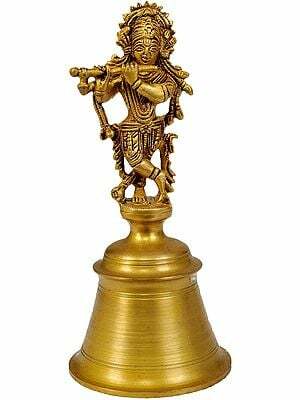 In Christianity it is with the sound of the bell that the departed soul is bid adieu and the newborn is welcomed. In Christian ecclesiastical system the bell’s type or class determines a clergy’s rank, authority and status. 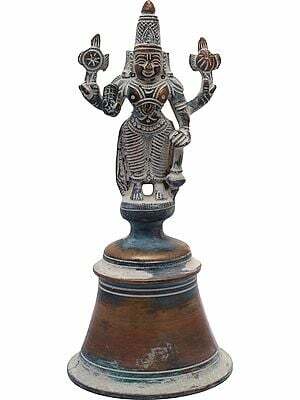 Its ritual role apart, in India the bell has been since long also an auspicious and sacred art motif often carved on temples’ entrances and cast in metals for gifting. The world heritage site Khajuraho has a tenth-eleventh century temple with all its pillars carved with bell-motifs. 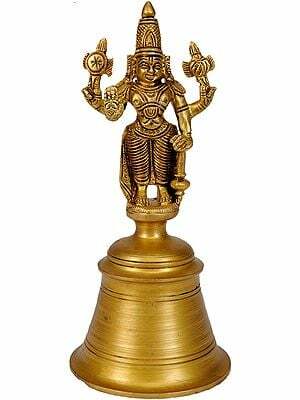 It is hence known as ‘Ghantiya’ temple, the temple consisting of bells. The cult of casting or making bells, in any medium, adding to their form artistic flavour has been in prevalence since long. 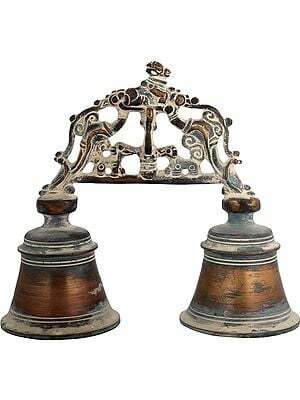 The Patna Museum, Bihar, has in its collection one specimen of such artistic bell, dated tenth century. 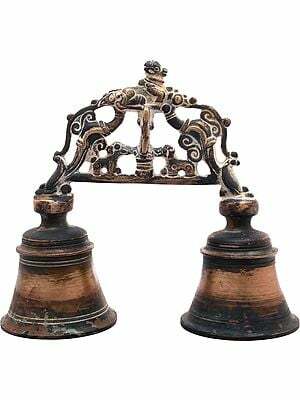 This bell was recovered from Gandhakuti, Kurkihar, one of the excavated Buddhist sites, a ‘vihara’ where Buddha is known to stay more than once. 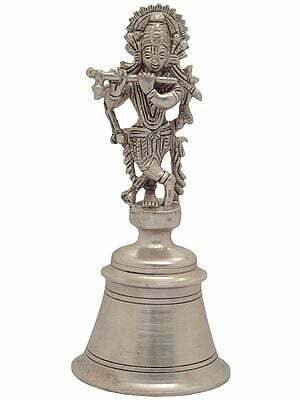 The bell seems to have been gifted to the ‘vihara’ by some donor. 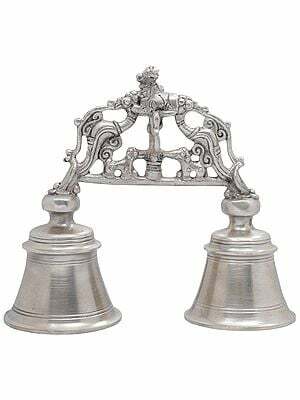 Cast with elaborate details the bell presents a delightful synthesis of a number of traditions, mainly Buddhist and Vaishnava. 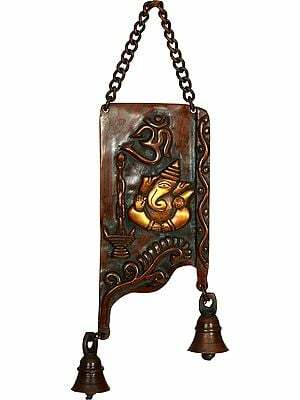 Besides its form, resembling a votive ‘stupa’ and the style of loops of the chain, the hook to hang on has a form identical to Tibetan-Chinese dragon though not without the form of a horse blended with it, a celebrated religio-art motif both in China and Tibet. 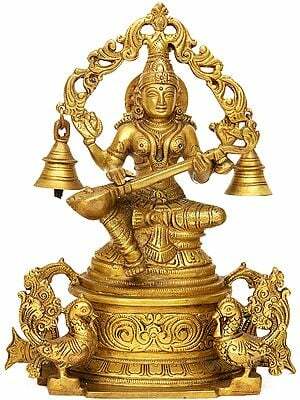 The main theme of the bell : Lord Vishnu’s ten incarnations in the upper column and reliefs of Shesha-shayi Vishnu with Lakshmi, Uma-Maheshvara, Rama and Sita with Hanuman in attendance, Ganesha and Saraswati, in the lower register , is essentially Vaishnava. The floral arabesque in the lower ring around the divine icons and the geometric design on the base edge of the bell reveal Islamic art influence. 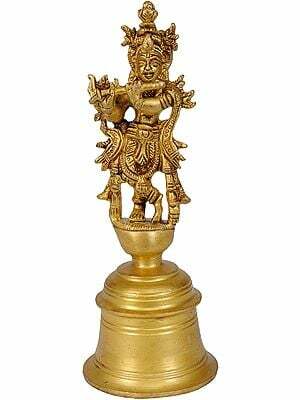 Apart, it inherits its aesthetic beauty, magnificence, finesse, finish and ability to discover such fine details from the tradition of South Indian art of bronze casting. 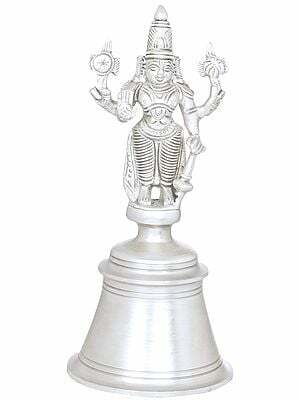 The artist has used the middle part of the bell just below the canopying projection, the two horizontal bands, the ‘jangha’ – elevation above the plinth, and ‘vaksha’ – breast-part, above the ‘jangha’, as such elevated parts are defined in temple architecture, for illustrating his theme, the ‘jangha’ portraying Lord Vishnu and Lakshmi, Uma-Maheshvara and others, and the ‘vaksha’, the ten incarnations. 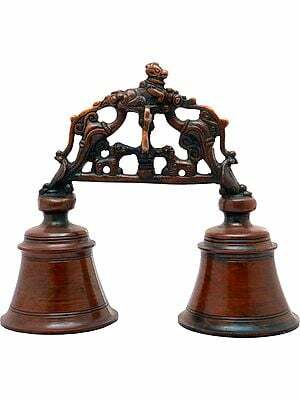 With highly artistic floral arabesques wreathed around, the ‘jangha’ represents a four-armed form of Lord Ganesha seated in ‘utkut-akasana’ – a casual mode of sitting. 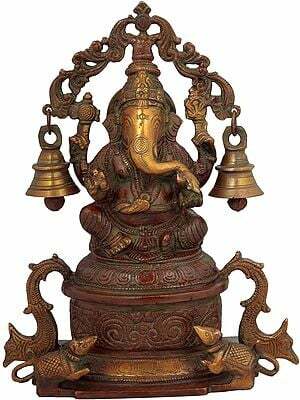 His trunk turned to left is consuming ‘laddus’ that the elephant god holds in one of his hands. 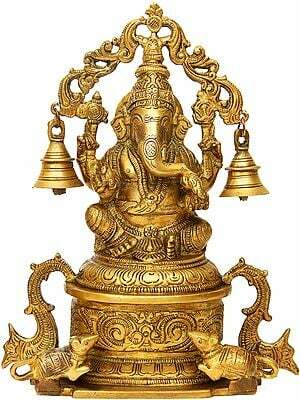 On his left have been illustrated Uma-Maheshvara, Lord Ganesha’s parents. 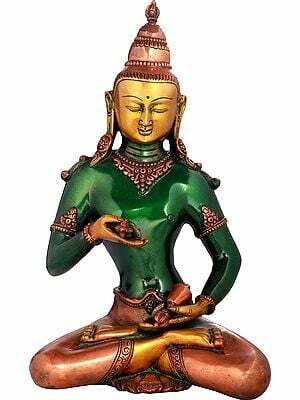 Uma or Parvati is holding in her hand some unidentifiable object. 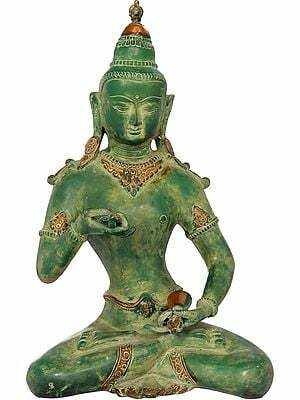 Next on the left have been carved Lord Vishnu and his consort Lakshmi seated on serpent Shesha, known as ‘Shesha-shayi Vishnu. Towards his left lay his mace. Both Uma and Lakshmi have been represented as seated on their spouses’ right, not on the usual left. 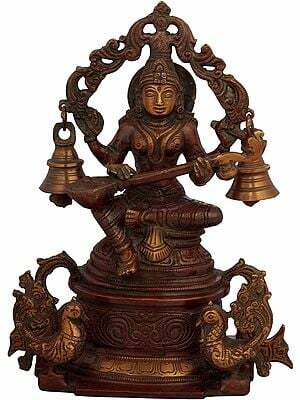 Next to Shesha-shayi Vishnu has been represented Saraswati playing on her ‘vina’ – stringed instrument. 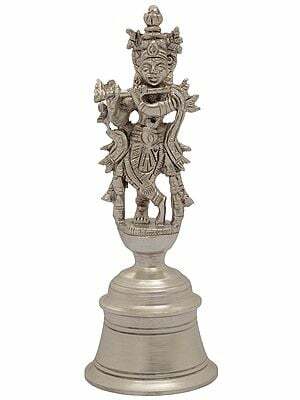 The last divinity on this band is Lord Rama seated with Sita, and Hanuman with folded hands on the floor. The upper register represents Lord Vishnu's ten incarnations, namely, Matsyavatara – fish incarnation represented as half fish and half four-armed human form in ‘abhaya-mudra’ – granting freedom from fear; Kurmavatara – tortoise incarnation : half tortoise and half four-armed human form seated in ‘padmasana’; Varahavatara – boar incarnation, holding earth on his tusk and carrying mace and lotus; Narsimhavatara – half man and half loin form, tearing the body of Hiranyakashipu with two of his hands and carrying in other two conch and lotus; Vamanavatara – normal two-armed Dwarf incarnation carrying a ‘kamandala’ – water pot, and umbrella; Parashuramavatara, a four-armed unusual form carrying battle-axe, bow, lotus and mace; Ramavatara, Rama represented carrying in his hands bow and arrow; Balaramavatara, Balarama represented carrying mace, lotus or conch and plough on his shoulder; Buddhavatara, Buddha represented as seated in ‘padmasana’ and granting ‘abhaya’ – freedom from fear; and, finally, Kalki-avatar, Kalki represented as riding a horse, the incarnation yet to take place. 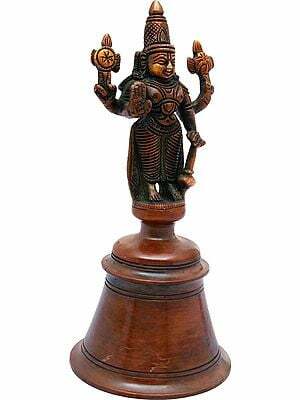 Perhaps influenced by Oriya tradition under which Krishna as Jagannatha is himself Vishnu and all are his incarnations, the artist has not included him among ten incarnations.